In good condition. No flaws. Comes from smoke free and pet free animal. 44” total length. 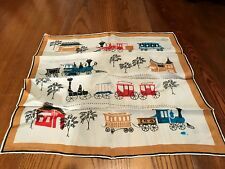 An exquisite silk scarf with fabulous train engines & depots ~ Exquisite ! This large square shawl is made from silk (it feels like silk, but could be a blend). Mocha Brown and Chartreuse Green are the main colors. Squares throughout with PA DUTCH looking couples.Rocking Horse and Large Roses. Rayon fabric. You will receive EXACTLY what is pictured. There is a large hole in the center, a sm ches by s se size="4">. They range from pieces that are poor quality to magnificent. They range from pieces that are poor quality to magnificent. From the 1930s-1940s. Smoke Free and Pet Free. 84" from end to end, 13" deep 3" fringe. This item is exquisite! A friend of mine says the color is more "peachy than pink" but I still see pink. This is a stunning and rare 1920s 30s long ostrich marabou feather boa or collar. boa length: 83" ( 211 cm). made of one full string of thick bounty of real brown ostrich feathers which are super soft, thick and shiny. Vintage 1930's ladies shawl or stole, which has been produced from black fabric covered with black marabou feathers. AGE Circa 1930's SIZE The stole measures 97cm (38½") long and 32cm (12") wide. CONDITION The stole is in a good condition for age, although there is a little molting to the feathers. There is also some wear to the lining, with one of the wrist straps being held in place with a safety pin. Please refer to the above photographs for details of condition. Size 11 1/2" x 50.". Mint Condition. No Stains, No Fading. Unique and Striking. REAL red fox hind legs with feet / paws including pads & claws! Both hind legs are complete with paws including the foot pads and claws. Super amazing and unusual fur piece! Very rare design, I have seen no others like it anywhere! Very Dainty Art Deco Gold scarf, see through centre. 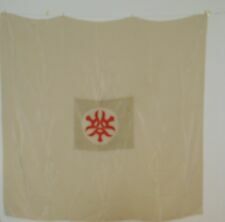 (150cm (one side) x 34cm. 4.5cm - see 2nd to last photo). I do my very best to carefully list/illustrate any flaws I find. Vintage 1930s real red fox fur stole. In good condition with all legs, ears and tail etc still attached. A little age related damage to lining as seen in picture but otherwise fine. There's a clip and knotted tie to clip it to, both in working order. Beautiful antique black silk embroidered crepe piano shawl with fringing. This shawl measures 93 x 88 cm. The perfect fringing measures 48 cm that is 19 inches. The shawl is in perfect condition. no visible holes. The fringing is long and in perfect condition. The embroidery is typical chinoiserie pink,yellow and peach flowers. Green leaves with pink and yellow blossom. There is a butterfly in green , red, yellow and orange. The embroidery is one corner and the stunning embroidered area measures 64 x 58 cm. 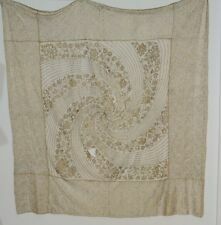 This shawl is 1920s -1930s and is in incredible condition. It would be perfect over a simple black evening dress or jacket. No returns acceped on this lovely item, the buyer will love it. This is a lovely antique silk shawl. It probably dates from the late 1920s or 1930s. The fabric is very light mint green silk crepe on one side and lined with an even softer light mint green silk. It has a bamboo print at either end and tiny embroidery stitches as part of the design. Made from 3 full mink and is double sided fur (top and underside). Fastens with a brown (plastic / bakerlite? ). Not sure of exact age but it belonged to a great aunt and is believed to date from the 1930s. St Class Signed For within the UK. Looks great also as a more modern casual look over a denim jacket. Marabou feathers are characterized by their very fine, dense, downy and very fluffy short nap (length), and are velvety soft". This truly is a wonderfully luxurious piece of clothing and would look fabulous for a wedding or any formal occasion. TRUE VINTAGE ANTIQUE ART DECO ASSUIT SHAWL NICKEL SILVER BLACK MESH 94" X 24"
Length from tail to tail is 125cm. Original hook and chain for adjustable use. Two real pelts with glass eyes. DRESS TO IMPRESS WITH THIS FUR AS AN ADDITION TO ANY SUIT OR DRESS AT A WEDDING, GALA EVENT OR REVIVAL WEEKEND. BACKING IS IN A RUCHED BOWN SATIN LIKE MATERIAL. BAKELITE SNAP CLOSE. QUALITY REAL FUR STOLE. FULLY LINED. IN VERY GOOD PRE LOVED CONDITION INCLUDING A CLEAN LINING. ANTIQUE SILK LARGE PIANO SHAWL RED FRINGE. Beautiful deep red double sided (two layers of silk) fringed shawl. Subtle pattern woven into the silk. fringe length: 30cm. 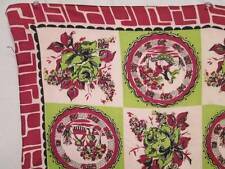 Although sold as used this antique shawl is in remarkably good condition. Fox paws, tails and one fox's head. Chain and hook to fasten. The length including the tails is 108" x about 7" wide. Hand sewn silky lining in a muted, dark green.